MANILA, Philippines – CLS Knights Indonesia erased an 18-point San Miguel Alab Pilipinas lead but the Filipinos led by import Renaldo Balkman outlasted the home team, 88-80 in overtime in Surabaya, Indonesia on Sunday, December 16, 2018. Just a week ago, the San Miguel Alab Pilipinas made an impressive debut in the 2018-2019 ASEAN Basketball Leage (ABL) as they edged the CLS Knights Indonesia in a home game. Tonight, team Pilipinas travelled miles away from home to continue its winning streak. It was not the same way Alab started way back in Sta. Rosa, Laguna as the nationals found it tough to score in Knights’ turf. Good thing that Indonesia had missed a handful of shots too early in the 1st quarter. Halfway through, the score got stuck with 6-0 in favor of Philippines. Knights made a way to put themselves on the scoreboard but Alab had finally found its rhythm and quickly doubled their lead in less than couple of minutes. It was an overall effort from the Filipinos as they ended the opener with a convincing 19-11 lead. Josh Urbiztondo’s insertion in the 2nd period helped Alab Pilipinas widened its margin to double digits. 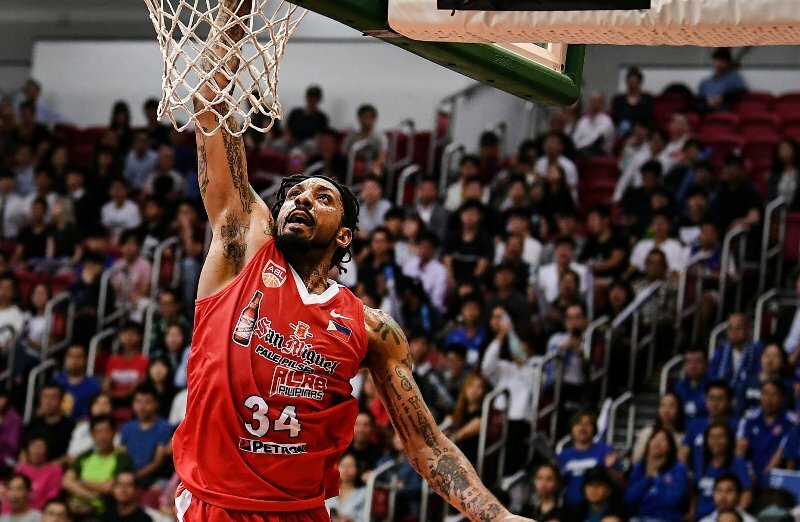 Renaldo Balkman caught fire in the latter phase of the second and steered his team to a personal 5-0 scoring run to post an 18-point big lead. Max Esho on the other hand, had his own 5-0 personal scoring surge to lessen the Alab margin. Aside from Balkman, his compatriot, the 7’3” PJ Ramos had his offensive momentum as well that kept Philippines apart from Indonesia and wrapped up the 1st half with a 13-point, 42-29 lead. Max Esho carried on with his offensive mindset in the 3rd quarter and aided the Knights in lowering Alab’s lead to 8 in just 2 minutes. The Indonesian crowd even went wild after Esho sank a seamless trey to downsize Philippine’s lead to just 2. Alab’s once 18-point advantage had totally vanished at the 4-minute mark as the Knights finally turned the tides to their favor and levelled the game at 47. Just as Indonesia had its offense going, Caleb Tiongson spoiled the party as he unleashed 2 consecutive long three-pointers to regain the lead. Alab Pilipinas survived the 3rd period with a razor-thin 57-55 advantage. CLS tasted its first ever lead of the game as Brandon Jawato scored a triple followed by another long bomb from Sandy Kurniawan as the final quarter started. Knights’ margin had gone up to 7 but the Puerto Rican Dynamic Duo: Balkman and Ramos quickly erased it. The game was tied at 75 with 30 seconds left in the game. PJ Ramos forced his shot in the middle but missed. Wong Wei Long had his own opportunity to win the game with few ticks remaining but hit an airball instead that sent the game into an overtime. Both Max Esho and Renaldo Balkman entered the extra period with a 30-point ballgame performance. The ace players from both squads traded baskets but it was Balkman who came out stronger with 36 points and helped Alab Pilipinas secured an 88-80 win. Alab Pilipinas will be facing Formosa Dreamers next on Friday, December 21, 2018.